Lecturer, pianist, voice coach, piano accompanist with over 25 years of teaching and performing experience. 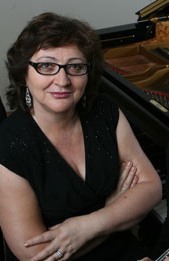 Special expertise: Russian vocal music, diction, repertoire, interpretation, and style. 1995 American Vocal Institute, Urbania, Italy. Post Graduate Program Russian Academy of Music, Moscow, Russia. Post Graduate Program St.Petersburg Philharmonic, St. Petersburg, Russia. Master of Music Academy of Arts, Ufa, Russia. 1972-1992 Articles and Presentation on major vocal forums in Russia. Performance, The Scarecrow Press, Inc. AWARDS: Winner of several best Accompanist awards and honor title.